This week brings WiiWare demos of five popular titles, a new Art Style title for the DSi, and Pokémon's answer to Gears of War Horde Mode, Pokémon Rumble. Demos, in my WiiWare? Preposterous! Yes, this week Nintendo is giving us a free taste of some of the more popular WiiWare titles, letting players who weren't sure about BIT.TRIP Beat, Crystal Chronicles: My Life as a Darklord, NyxQuest: Kindred Spirits, and World of Goo a chance to take the games for a test drive. It's about damn time, isn't it? Or you could demo Pokémon Rumble. It's the only original title hitting WiiWare this week, but when it's a Pokémon brawler, do you really need anything else? 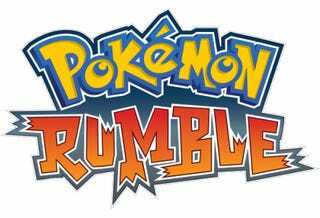 Priced at a hefty 1500 Wii points, Rumble pits your Pokémon against wave after wave of enemy Pokémon, using your special moves to win the day. You befriend enemy Pokémon as you progress, allowing you to choose the right Pokémon for the right Poké-situation. Up to four players can participate locally, making this a fine party game for the younger set. DSiWare gets three new games this week, and one of them has Art Style in the name. Art Style: DIGIDRIVE (500 DSi points) is a traffic manipulating puzzle game, where stacking similar cars gives you the fuel to keep stacking similar cars. Skyworks Interactive brings us Arcade Bowling (200 points), a ball-flicking bowler from classic Activision game designer David Crane. Finally we have Robot Rescue from Teyon (200 points), a logic game about manipulating linked robots through a deadly labyrinth. A fine lineup this week, and let's not forget the Virtual Console, where Indiana Jones' Greatest Adventure for the Super Nintendo (800 Wii points) and Street Fighter II Championship Edition for the TurboGrafx16 (700 points) both go on sale today. Check out the official descriptions below, and get ready to download the hell out of some WiiWare demos. Description: Available exclusively for the WiiWare service, Pokémon Rumble is an action game in which you control Toy Pokémon (referred to as "Pokémon") and take on wave after wave of other Pokémon in a variety of stages. You can befriend some of the defeated Pokémon along the way, which lets you add them to your collection and grants you the ability to use them in battle. Switch between collected Pokémon at any time, taking advantage of the fact that the amount of damage you deal depends on the type of move used and the type of Pokémon hit. Be the last one standing to gain the right to compete in the Battle Royale and test your skills against many Pokémon at once. You can also team up with three people for some multiplayer action (additional Wii Remote controllers required), working together to take down tough Bosses and earning points that can be used toward recruiting or training Pokémon. You can even save your favorite Pokémon to your Wii Remote™ controller for exchanges with friends. Combining beautiful cel-shaded graphics and exciting game-play features, this is one rumble you won't want to miss. Note that a demo version of Pokémon Rumble is also available for zero Wii Points. Description: BIT.TRIP BEAT brings retro action back as you use the Wii Remote controller's motion sensor to bounce beats in this rhythm game. Retro visuals, classic game play, four-player multiplayer and an 8-bit soundtrack will get you in the zone and rock your world. Pay attention, though: As with most classic games, the challenges are mighty. If you can stay cool as the difficulty increases, you'll discover the beginnings of the BIT.TRIP saga. Description: Step into the royal shoes of the Darklord's daughter as she installs traps and monsters inside her tower to fight back the endless waves of invading adventurers in this world-conquest role-playing game. Filling your demonic tower with monsters and traps called Artifacts is your only hope to keep the adventurers from destroying the Dark Crystal on the top floor. Fly your tower across the land and conquer every stage on your way to dominating the entire world. Description: NyxQuest: Kindred Spirits is the awesome story of Nyx, an enigmatic winged girl who must descend from heaven in search of her missing friend, Icarus. Fly over the ruins of ancient Greece and avoid falling into blazing sands or perishing in the claws of cruel harpies and hydras. You'll need the help of Zeus and other benevolent gods from Olympus to summon their powers. They will let you cast rays, modify the scenery and control winds at will. Fly, aim and shoot using the Wii Remote controller. Play with a friend and maximize your abilities: While one player controls Nyx, the other will control the powers from the gods. Description: World of Goo is an award-winning, physics-based puzzle/construction game made entirely by two guys. Use living, squirming, talking globs of goo to build structures, bridges, cannonballs, zeppelins and giant tongues. The millions of Goo Balls that live in the beautiful World of Goo are curious to explore, but they don't know that they are in a game, nor that they are extremely delicious. Description: Grab your trusty whip and slash your way through all three Indy classics in this no-thrills-barred adventure. If it happened in the movies, it happens here: the giant boulder from Raiders of the Lost Ark, the mine-cart chase from Temple of Doom, the three trials from Last Crusade, Rene Belloq and Colonel Vogel – it's three times the action, all in one fully loaded game. Description: This is the classic PCEngine (TurboGrafx16) version of the two-player fighting game that started it all. At the time, a large capacity HuCARD was used to allow faithful recreation of the dynamic arcade game and its features, including bonus stages and sound effects. In the game, players select one of 12 characters and face opponents in a no-holds-barred battle to decide the top fighter. Master a character's special moves and combos to defeat your rivals around the world. In "V.S. BATTLE" mode, there's a convenient handicap feature. Using this feature to adjust a character's performance, a novice player can be evenly matched against a seasoned player to enjoy an intense, head-to-head combat experience. Description: It's traffic control with a twist as you try to direct identical cars down the same road in Art Style: DIGIDRIVE. This constantly moving puzzle game combines an easily understood playing field (an intersection) and a simple goal (create fuel), challenging you to properly guide a never-ending stream of cars. Stack similar cars five deep to create some fuel, then use that fuel to continue your progress in the game. Play in ENDLESS mode to see how long you can last, or compete against the computer or a human opponent in VS mode. Use combos to your advantage and see if your reflexes can handle the intensity of Overdrive mode. When all is said and done, you may never look at gridlock quite the same way again. Description: From Skyworks comes another addictively classic game, Arcade Bowling. It was designed by video game legend David Crane, one of the original founders of Activision and one of the most critically acclaimed game designers of all time. In the tradition of everyone's favorite Boardwalk bowling game, use your stylus and steady aim to flick "laser" balls down the alley and up the ramp into the scoring holes. The farther away the scoring hole is, the more points you'll get. Arcade Bowling features three futuristic sound tracks, state-of-the-art 3-D graphics and two addictive game modes, Classic and Progressive. In Classic Mode, roll up to nine balls to score as many points as you can. In Progressive Mode, enjoy multiple levels of game play with increasing score plateaus and bonus targets. Description: Robot Rescue is a fun logic game based on a simple but entertaining concept. Your mission is to free robots trapped in 45 evil computer labyrinths while avoiding deadly traps. Sound easy? Not so fast. Each robot shares linked controls, so when you move one, you move them all. It will take clever planning and nerves of steel to pull off this electronic escape. You'll need to avoid many traps, such as mines or electrical circuits, and take advantage of special elements like glue stains. Choose one of three difficulty levels and get ready for a challenge.